I found so many banana bread recipes on the web. 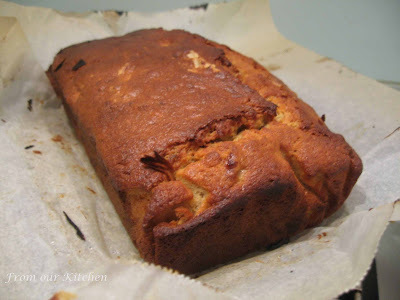 Whilst searching, I found this Melt and Mix Banana Bread recipe on Retromummy's blog which used maple syrup. I love reading Retromummy's blog. Corrie is a mother of four children under 5, with 1 set of twins. She is also a keen crafter who quilts, sews, knits, crochets and cross-stiches. On top of all that, she is also enjoys making delicious and easy home-cooked meals, cakes and muffins for her young family. I take my hat off to her. I made this before our weekend away in the country to take with us for breakfast or snacks. I like the idea of adding maple syrup, the aroma when baking is beautiful. hmmm.....that got me thinking 'cos i've one big bottle of maple syrup sitting at a corner of my fridge.....banana+maple sounds like a heavenly pair!! !